This colorful deck of hand-shaped cards helps children build their matching skills, memory skills and hand-eye coordination, all while having fun. Young players will love the finger-puppet inspired characters. Each deck features 15 different characters. Choose either our Animal or our People deck. For players aged 3 and up. Play by yourself or with your friends. Mad Rush – Race other players to match images as fast as you can. Hide and Seek – Search the grid to find matches for the characters on your card. Can you remember where you saw them last? 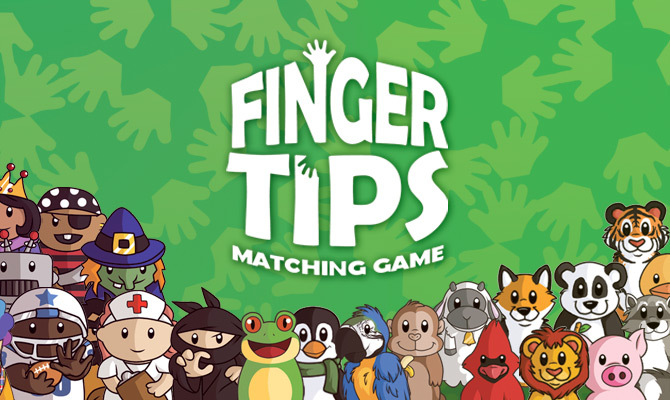 There’s a Finger Tips game for everyone! The plastic container makes this an ideal game to take with you on your next trip.